I made this thank you card, it's a bit out of the box for me, but I like the way it turned out. 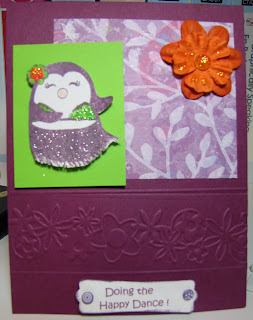 Used my new SU In-Color stuff, paper, ink, the patterned paper is Pocket Full of Posies by DCWV and the stamped image is a $1 imaginise stamp I picked up at Meijers, I stickled her top and glittered her skirt. Cuttlebugged the bottom of the card and used the ScorPal to put the lines around it. The tag is SU punch. I thought it was kind of a fun card.